Cutler-Hammer definite purpose (DP) contactors are designed to improve control of refrigeration, air conditioning, ventilation and resistance heating applications. The complete line offers everything from compact DPs to the smallest 50 ampere DP contactor in the world an average of 20% smaller than the competition. Always looking for new ways to improve the customer experience, the 50 mm (2") DP contactor with an innovative sealed housing is designed to keep out contaminants and lower noise. Building on that success, the new series of Compact DPs are now available in a sleek new sealed design. Continuing to innovate and upgrade products, Eaton offers the perfect definite purpose solution for your HVACR applications. 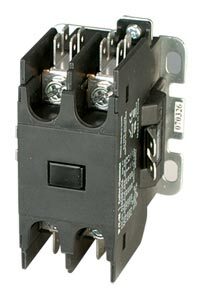 The new 30 ampere, single- and double-pole, Type C25 compact DP contactors feature a compact, efficient design with a low VA coil and straight through wiring. These devices are economically priced, UL recognized/CSA certified, are current rated and hp/kW rated with magnet coils rated Class F, 155°C (311°F) [most are Class B, 130°C (266°F)] and designed with low VA current ratings for less energy consumption. With the ability to be mounted vertically, horizontally or tabletop, the new series of compact DPs will meet all your definite purpose application needs.